If you haven’t seen the Neelakurinji (a flower that blooms once in 12 years) before, then you’re missing a real magical sight. 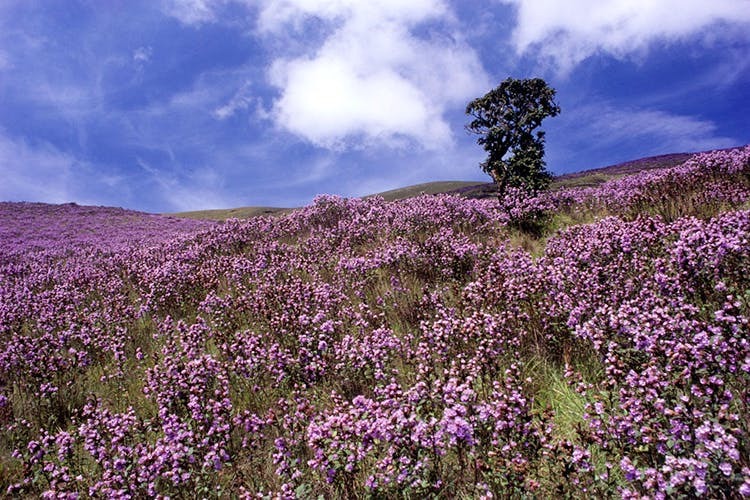 A hill flower typical to the Nilgiris, botanists call this flower neelakurinji thanks to the beautiful blue hue it has. There are 40 varieties that grow in this region and from memory of about two decades ago, the hills are covered almost completely by this flower — it’s like a blanket of blue. It’s almost unbelievable, but since we’ve got it documented, you better believe it’s true! This season, the flower is expected to begin blooming in July and will be in blossom all the way until October of this year. The prime spot to catch this majestic scene is apparently going to be the Eravikulam National Park in Munnar as the destination offers a view of Neelakurinji and Nilgiris range up close. You can also catch this rare phenomenon from good old Ooty and even Kodaikanal, though that is not really the Nilgiris. Coorg too gets a fair share of the flower, but to see an entire mountainside, carpeted with this flower, you best make reservations in Ooty or Munnar. While you may think that it is a while away, we’re giving you a heads up as the season will see plenty of tourists. Book your hotels or homestays ASAP or you won’t get space! In Ooty we recommend you stay at a heritage hotel, check into a charming homestay in Kodaikanal and check out these places to stay in Munnar. We plan to just at the Kurinji homestay in Kodai, because of its name! Check out more about the flower here.